With the failed rescue operations of the Quirino Grand Stand hostage crisis back in 2010, the Quezon City Police District (QCPD) opted to hold simulations of hostage taking in order to prepare for the worst. 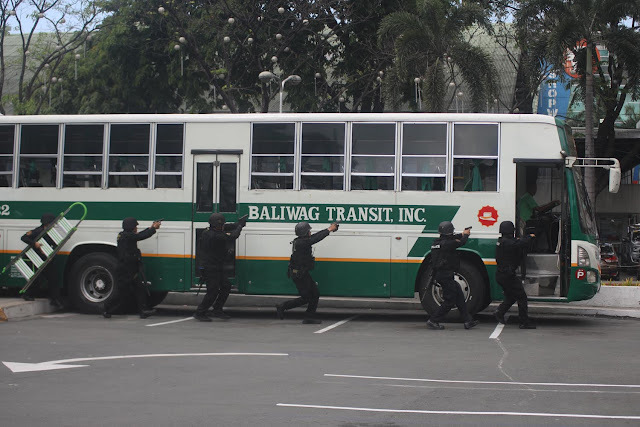 With a bus in the middle of Cubao, armed suspects, bombs, hostages and the media that was behind a confined zone away from the bus, the set was complete and everything was under control until two unexpected yet important realizations happened during the simulation. First of all, the police arrived too late. One of the most important points of improvement that the Philippine National Police (PNP) should work on life-and-death situations like the hostage crisis. Second would be the inability to withhold the zealous media from flooding the scene. During the simulation, two cameramen went to negotiate, something that shouldn’t happen given that the fact that the situation was critical and volatile at the same time. The incoming chief Director of the PNP, Oscar Abayalde was disappointed at the outcome, most especially the useless media intervention. "If that were true, the safety of the media would have been compromised, and of course, the operation itself," Albayalde said. "The safety of the media practitioners who went near because the suspect was armed and dangerous, then the operation would have been compromised if there was a television inside just like what happened in Luneta," Albayalde added. The incoming chief Director even recalled the events during the 2010 crisis, when the media was asked not to televise the arrest of the suspect’s brother, yet to no avail did this happen. "At about 7:15 pm, a policeman explicitly asked TV reporters not to cover live the arrest of Mendoza’s brother, Gregorio. Gregorio, who was also a policeman, was accused of being an accessory to the crime his brother was committing. Despite the policeman’s pleas and his colleagues’ attempts to prevent the media from covering the arrest, all the television stations continued covering it live." This was supposedly to delayed publicity was supposed to manipulate the suspect in thinking that he had a chance on escaping, a thought that would’ve urged him to leave behind the hostages. "They all wanted a good story. Kaya talagang napaka-importante yung role ng ating mga kaibigan sa media hindi natin talaga natin maiwasan 'yan kung talagang makakasingit, sisingit. So it's really very important doon sa umpisa pa lang meron tayong napansin ko kaagad 'yun na walang nagcocontrol sa ating media." Even if the PNP had a lacking in keeping the media entities at bay, the media itself should be responsible enough to know that the operation and safety of the people comes first before their greedy and inconsiderate desire to get a good shot of the crisis.